Here is another great news for Assam Rifles recruitment 2017. Assam Rifles has invited application from applicants in Offline Mode. Eligible candidates can submit their application to Assam Rifles before 20 August/2017. I have described all the information like eligibility criteria, salary, Total vacancy, Selection Procedure, Job description, last date to apply, Application procedure and other key information here. Check below if you are interested to join Assam Rifles in 2017 through the recruitment rally. You can apply for Assam Rifles recruitment 2017 on or before 20-08-2017 for this defense job in Assam. Assam Rifles in Meghalaya invites applications from the eligible candidates to recruit in the following posts. Total vacancy is 65 Nos. Require Age- Candidates Applicant age should be between 18 to 23 Years. Educational Qualification- The candidates should have completed Matriculation or its equivalent qualification from a recognized Board or Institute & has Participated in any international Competition/ National Competition/ Inter-University Tournaments/National/Sports/ Games for Schools/Physical Efficient Drive. For Posts wise eligibility criteria details refer official notification. Process of Application- All Eligible Candidates Can Download application Form through official website http://www.assamrifles.gov.in. After Filling The application form, candidate must send hard copy of application along with relevant testimonials (Mentioned In Detailed Advertisement) to the following Address before or on 20-08-2017. Examination Fee- The General and OBC category candidates should pay fee of Rs 100/ (Rupees one hundred only) (Non-refundable) in the form of IPO (Indian Postal Order) The IPO (Indian Postal Order) should be prepared in favour of Recruitment Branch, HQ DGAR, Shillong - 793010. SC/ST and Female candidates are exempted for payment of examination fees. Stages of Examination- Eligible candidates will have to take a Documentation, Physical Standard Test, Physical Efficient Test followed by Medical Examination conducted by Assam Rifles. I have shared all the important knowledge for the upcoming Rifleman Recruitment here. In this website you will always get the clear picture of any Latest Job in Assam. This is completely free service for you. Rifleman in Assam Rifles will be a good job for you if you are eligible for the post mentioned above, apply before the last date. Monthly pay for the Assam Rifle job is also good. 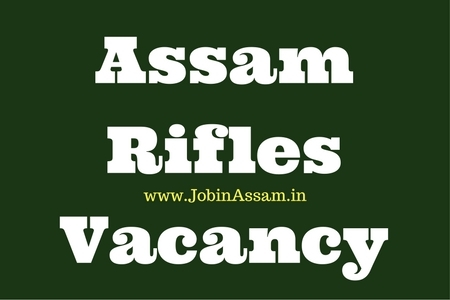 For more about this Rifleman vacancy like our JobinAssam facebook page and twitter page of JOBINASSAM.